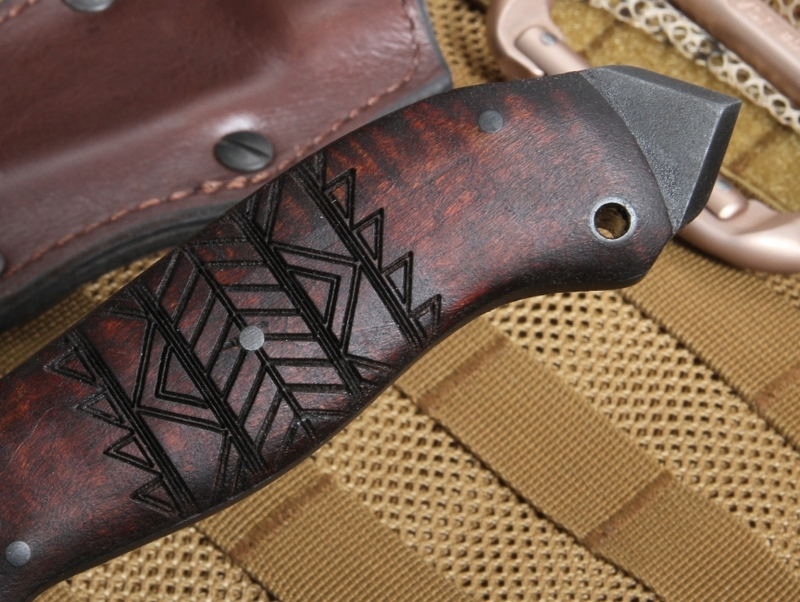 "The Winkler Spike is a primitive meets modern tactical fixed blade. 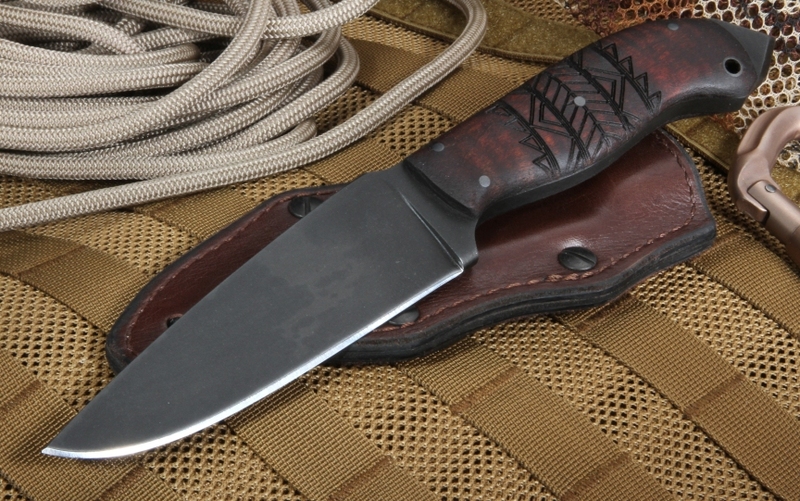 The combination of native and practical is what makes Winkler knives so compelling." The knife's function determines the type and features of the equipment. 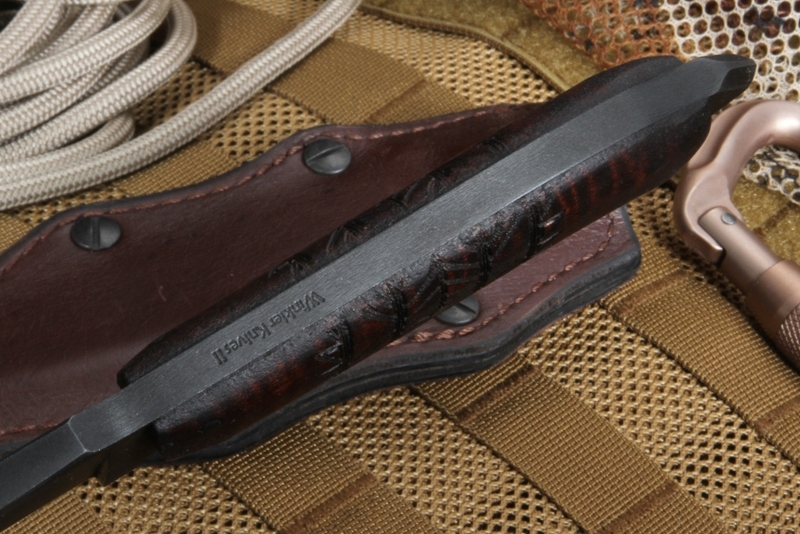 A well-made tactical knife stands the test of time and endures extensive wear and tear. The full tang construction between the blade and handle is sturdy and secure allowing for immediate transport horizontally or vertically on a belt. As far as blade standards go, you want to consider a sharp cutting edge with a strong thick point. The Spike model comes in 80CRV2 carbon steel with a matte black Caswell coating. Bulky equipment is cumbersome; the ergonomics (how it feels in your hand) whether in a reverse grip or forward grip requires a comfortable feel. The tribal pattern tiger stripe maple is grippy and durable. A signature feature on this Winkler is the exposed pommel spike at the end of the handle. Part of the feel involves a good weight of 6.9 ounces with a 5" inch blade, perfect for those special operations or tactical maneuvers. A poorly made knife still won't fit your needs. A blade designed with high-quality steel ensures a razor-sharp edge, making for easier sharpening when needed. Regardless of preference always get a knife with a quality blade. A Winkler Spike fixed knife is a classic blade using carbon steel with a thickness of about 0.20". So there you have it, the basics for a classic fixed blade. Whether fixed or folded get a knife that is suitable for your needs, made with quality materials, with a comfortable feel. The Winkler Spike line offers a variety of premium knives to choose from and you will have peace of mind when you use any of their products. At KnifeArt we specialize in quality knives. Whether for you or as a gift there is something for everyone. We are an authorized dealer and offer a satisfaction guarantee for our products. For more information on how to select the perfect knife for you contact us today. Purchase & delivery smooth & painless, website provide good visuals of the product. The knife is a wonder to hold and behold. There is no excess in it. A large, strong knife, it's capable of fine work - perfectly controllable in sharpening a pencil to an ultimately fine point, for example. Seems very, very sharp. Beware the spike, it's sharper than you might expect. As with most fixed blades, I find myself wanting a bit longer hilt. Scabbard is as valuable as the knife.